East Jakarta Maritime Agriculture and Food Tenacity (KPKP) Sub-dept. 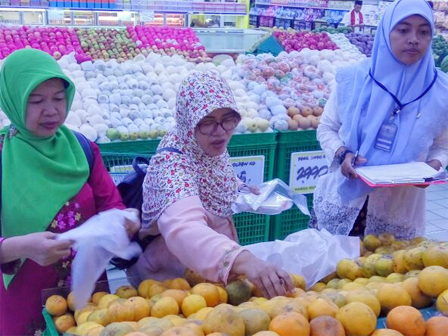 and Jakarta Drug and Food Control Agency (BPOM) held food examination in five modern markets.
" After being tested in laboratory, we found no hazardous substance in 250 samples"
East Jakarta KPKP Sub-dept. Head, Agung Priambodo said, personnel took product sample from agriculture, livestock, and fishery in each markets. "After being tested in laboratory, we found no hazardous substance in 250 samples," he said, Thursday (8/24). East Jakarta Economy Section Head, Yenny Asnita added, the team found textile dyes used on ice cream from merchant located outside of modern market. "It has strange color. We have warned the merchant," she closed.